By the 13th century, a knight’s armour had changed in many ways. Most knights had mail mittens at the end of the sleeves of their hauberk. Theses were split along the palms so that the hands could be freed without taking off the rest of the armour. Helmets called flat-topped helms became fashionable and a new lozenge-shaped shield came into use. Many knights took to wearing linen tunics called surcoats which were slit up the back and front to make riding easier. The crusading knights found these surcoats particularly useful in the Holy Land as they shielded their armour from the sun and helped to keep them cool. Moreover, the knight’s coat-of-arms could be displayed on his surcoat so that everyone knew who he was. 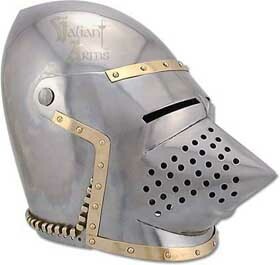 During the 14th century, a new kind of helmet or helm called a bascinet was introduced. It was a mail skull cap and an elaborate helm could be placed over it. A heavy cape of mail called an aventail hung down from the bottom of the helmet to protect the neck and shoulders. The armpits were protects by roundels, the elbows by couters or elbow-kops, the knees by poleyns or knee-kops and the feet by solerets. The upper arms were enclosed in plate armour called rerebraces, the lower arms by vambraces and the legs by schynbalds. All these pieces of plate armour were held in place by straps and buckles and were worn over te top of a suit of mail. At this time, the prick spur was replaced by the rowel spur and the lozenge-shaped shield by a flat-rion-shaped shield. By 1415, whole suits of plate armour were available. Bascinets with visors of the houndskull type were worn. Breast and back plates protected the upper part of the body. The lower part was defended by a series of thin plates called a fauld. 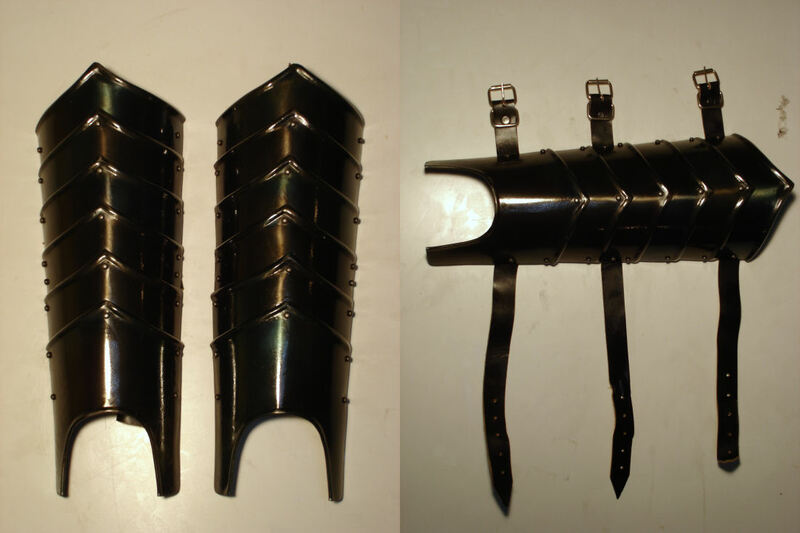 The joints were given even more protection by the use of pauldrons, coudes and genouilleres. The knight still wore mail underneath his plate armour. The greatest weakness of this kind of armour was that the wearer could not turn his head to see behind him as his helmet was fixed in place. By the 16th century the greatest days of working armour were over and yet this was the time when the finest harnesses were made. Splendid close-fitting helms called armets were worn while the breast and back plates were perfectly moulded to fit the shape of the wearer’s body. 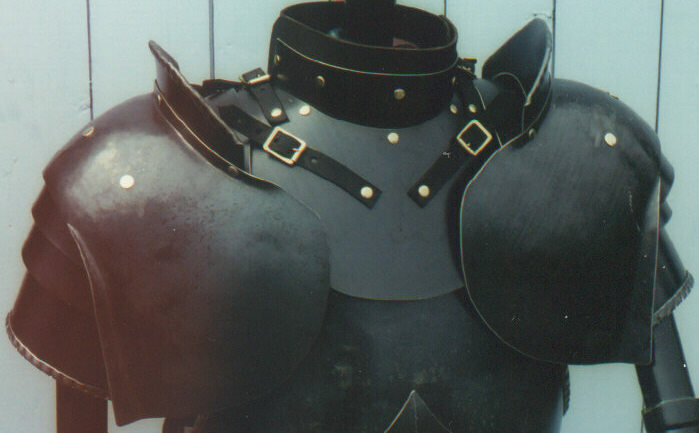 Thigh protectors called taces were added to the fould and the head and shoulders were defended by raised haute pieces. By this time a shield was rarely used so that the left pauldron was reinforced with a large plate while the neck was surrounded by a metal beaver. The arms and legs were completely encased in armour.